They are so cute!! I admire you for taking on this challenge! 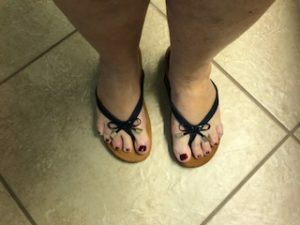 But, unfortunately you were not successful in convincing me to try flip-flops again….moving on to the next item on my bucket list!! Thanks! Everyone’s bucket list is different! Who would have thunk mine would have included wearing flip flops? They’re cute not like the flip flops of the 50’s. There was a time flip flops were also called thongs. A friend recently called out I lost my thong. Her 34 year old son yelled mother. How definitions change over generations! I can certainly understand how the thing reference can be misconstrued! I remember thongs and zories! You’re the second person to tell me about Vionic. Definitely going to look into them. And yes, I’ve been trying lots of new things as well this past couple of years. And like you, some worked out, some didn’t. I’ve got a few still on the scared-to-try list but working on them! Hi, Pat! Good to hear from you. Someone also told me about a brand of shoe called Abeo, so I’m trying a pair of those, as well. So far, so good with both the Vionics and Abeos! Your flip flops are super cute, although I feel some apprehension for your baby toe out there all by itself. Be careful around table legs and bed stand corners. Good Luck!!! Good point, Bonnie. Those chair legs and bed corners can be deadly!!! Next Next post: Flying Creatures Of The World, Unite!